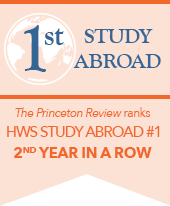 What makes an HWS education distinctive? It's the focus on learning. 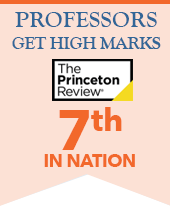 As a member of the intellectual community at HWS, students have access to talented, caring professors and work closely with their faculty advisers to design an academic plan that’s tailored to their own interests, strengths and goals. With 45 majors and 68 minors, the flexibility of the curriculum along with opportunities for research, study abroad, service learning and internships, empower students with the clarity and confidence that translates into viable career and graduate school options. The First-Year experience would not be complete without its quintessential Seminar. Without regard for future major or minor choices, seminars were constructed around different faculty interests - from peace movements to ancient warfare, Mozart and rock-and-roll. Each seminar is designed to hone writing, speaking, critical thinking and other academic skills that students will draw upon throughout their careers at HWS. Hobart and William Smith offer a Maymester program to students. Maymester is open to all students, and allows students to take one course with an HWS faculty member for 3.5 hours, five days a week. All majors (except those marked with an asterisk) may also be pursued as minors.